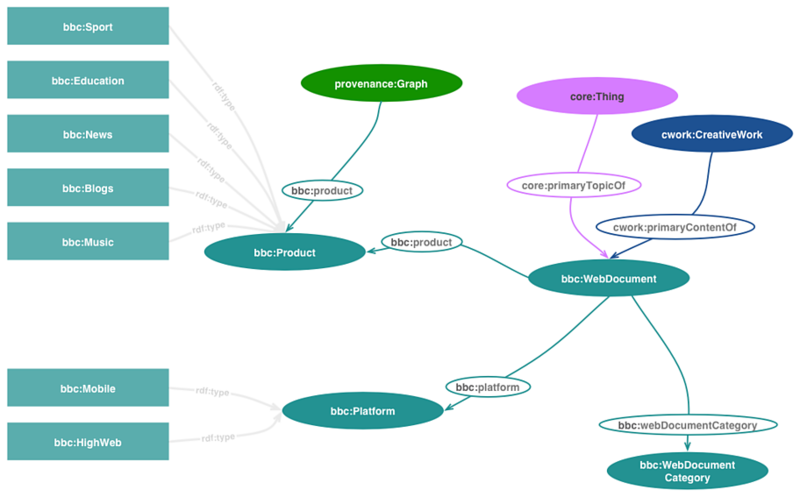 The BBC ontology is used to describe BBC concepts in the store. For example, the BBC divisions (products) publishing linked data and interfacing with the triplestore, the platforms for which we produce content and the web documents that publish or are relevant to the BBC's content. The BBC ontology codifies the logic that connects web documents, BBC products and platforms for which content is availalble. Currently there are 10 major products in Future Media which produce content for BBC online. The majority of those contain more products dedicated in thematic areas, for example Education propositions are part of the K&L (Knowledge and Learning) product portfolio. are outlets for the same story, i.e., the story behind Mo Farah's training. The wikipedia page for MK Dons http://en.wikipedia.org/wiki/Milton_Keynes_Dons_F.C. Automatically generated documentation for the ontology terms. Class representing a BBC News service, e.g., BBC Guernsey. Represents the different types of platforms through which a web document can be accessed. This is needed to derive the correct web document for consumption from the appropriate platform. If there's no specification on platform suitability then the document is considered to be suitable for both. Class representing products which create content about things. Within the BBC's scope, this would be one of the ten Future Media Products. Outside the BBC, this could refer to an organisation or company whose web pages we link to. Typically the official web pages of things (e.g., http://www.tomdaley.tv/) or their Wikipedia, Twitter and Facebook pages. A web document is a page available from a content-negotiable URL on the BBC website or any web document to which the BBC points at. This class is needed to support the different categories of web documents. This is meant to be extended by the clients with categories of web documents that make sense to their own product. For example, dynamically generated aggregations of content or editorially curated profiles of things. Associates a Thing with a regional BBC service which reports on it. Associates a regional BBC service with a Thing that it regularly reports on. Associates a regional BBC service with an audience facing output such as a News website. Associates a web document with one of the platforms for which the WebDocument is appropriate. If the WebDocument is responsive then this property is not used because the WebDocument is appropriate for both platforms. Only one of the two allowed values (bbc:HighWeb, bbc:Mobile) can be used for every WebDocument. Therefore the property is used with at most one value per WebDocument. Represents the fact that a web document has as primary content the creative work (e.g., a news story about Tom Daley is the primary content of a webpage). Associates the WebDocument with the particular BBC Product it belongs to. This reflects the editorial branding of the product. Associates a populated place with a regional BBC service that it is served by. Associates a regional BBC service with a populated place that it serves. Associates a web document with a category as defined by clients.